I have more or less finished a shop job on my Simpsons Pinball Party over six years in the waiting. One problem that I have been frustrated with was the drop target bank got confused sometimes and would award “drops completed” several times. Careful observation over an extended period of procrastination and play revealed that the middle target seemed to be at fault. I actually went as far as buying some new microswitches, just in case one was flaky. Then I remembered to always look for a bad connection first. The diodes on these switches are mounted on a terminal strip a few inches from the drops. I thought for sure one would be cracked, but they looked fine. So I pulled the drop target bank out of the game, and one of the QD connectors fell off of its switch lug. I used pliers to squish the switch a little bit together and slid it back on. So far so good! Does this look factory to you? Tonight’s lesson for me in vintage arcade collecting: Just because I’ve owned a game for 16 years doesn’t mean I’ve ever really gone through it. My Robotron had developed intermittent RAM errors after many reliable years. Sure, one of the 24 (!) RAMs might have gone bad, but it seemed equally likely to me that the power supply was probably getting flaky. I got about 4.7V across a cap on the computer board, and after reseating a couple connectors (not a proper fix, I know) I got 4.9. Good enough, and the RAM error is gone. Looking around, though, I saw this. This is part of the transformer strapping in the main power connector. Why were the wires cut? Why are the wires just twisted together? Why does only one wire have electrical tape? Why is the electrical tape applied wrong? The only answer I am sure of is why the electrical tape is falling off: because electrical tape is terrible. Maybe there were wire nuts on here at some point, but I doubt it. Some of the crimps were not great, either. The power supply still needs some attention, though. 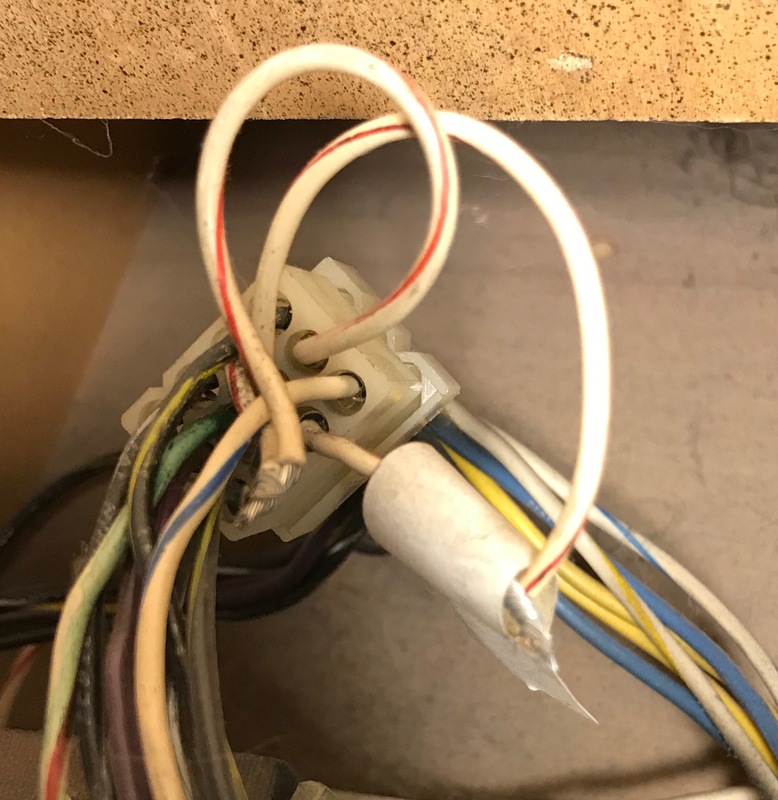 There are some other suspicious splices and a bypassed connector. Oh, well; for now, it’s playing fine. A decade ago, I tried to put one of Clay Cowgill’s multigame kits in this cabinet. It never worked correctly and I took it out. I wonder if the +5V was a little low even then. Perhaps I should give it another shot. I have had a Star Trek (Pro) and the parts for a knocker install, for well over two years. I decided it was time. I think this general plan would go for any metal-head game. Get a real manual from an old SAM game. This is helpful in finding places to pick up the needed voltages. I used WPT, because I have one. Stern manuals are terrible after about 2008, but they were superb before that. To tap voltages off existing connectors, get an IDC punch-down tool for .156″ pins. The trick to these is to run the wire into the connector just far enough. If it’s too far, it won’t punch down on the far side, no matter how hard you push. Star Trek never had a high voltage board for its DMD, so there are some mounting posts in the head not being used. Maybe it’s different in the LE. I installed the same step-up board that I used in WPT and Simpsons, except it now requires +20V. I just put it on one post and held it down with a #8 nut. The cable dressing here is pretty terrible. I may have to re-do this due to poor crimping anyway, and if I do, I will trim all of the wires to the same length and dress the harness neatly. +20V is available on J7-1, right next to another source that the game actually uses. In my Star Trek, it’s a fat orange wire. I suspect most SAM games have available +20V pins. Solenoid ground is available from J10-2,4,5. On Star Trek, pins 2 and 4 are not populated, so I stuffed a wire into pin 2. It appears the game generally uses black for this. I suspect most SAM games have available grounds. +50V is not as easy to get on Star Trek, as there are no spare supplies. On WPT, the dedicated magnet supply wasn’t used, so there was an unused pin in the J10 connector. Star Trek, however, has a magnet. I tapped the magnet with a suitcase connector (Scotchlok). I had some trouble getting this to make contact. I either didn’t squeeze hard enough, or the second wire slipped out of position before I clamped down. In either case, next time, I’ll check continuity immediately before moving onto the next step. I ran a long cable with three wires out of the head and into the cabinet. 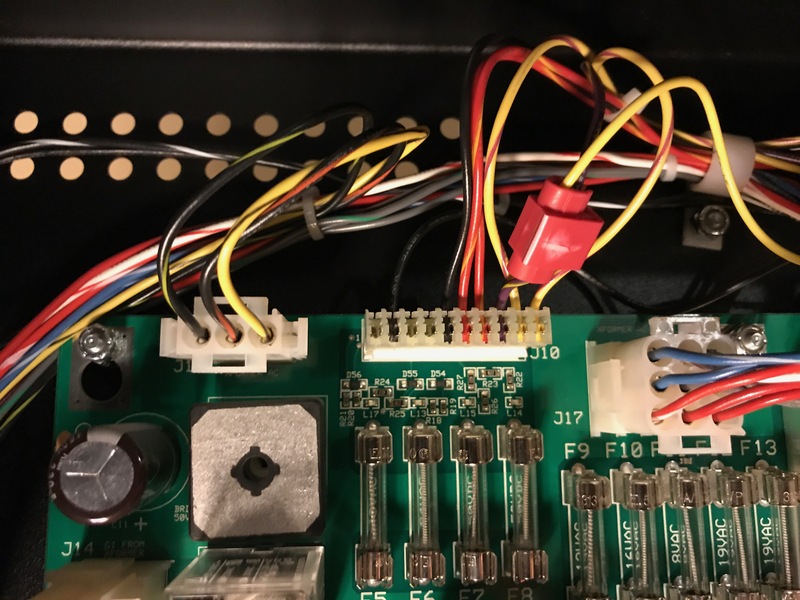 One wire picks up the Q24 output and gives it to the step-up board. One is +50V and one is the output from the step-up board to fire the solenoid. I screwed the knocker in the bottom and firing at the cross member near the coin box. I used screws that are a little too long and pierced the bottom of the cabinet. The cabinet bottom is not great plywood. I may change this over to T-nuts in the future. I believe I based this particular mounting on APB Enterprises’ directions on how to mount a knocker for their kits. 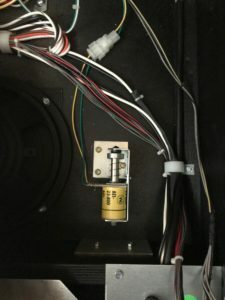 For my WPT mount, I eyeballed it and it’s relatively close to the coil–and wonderfully loud. 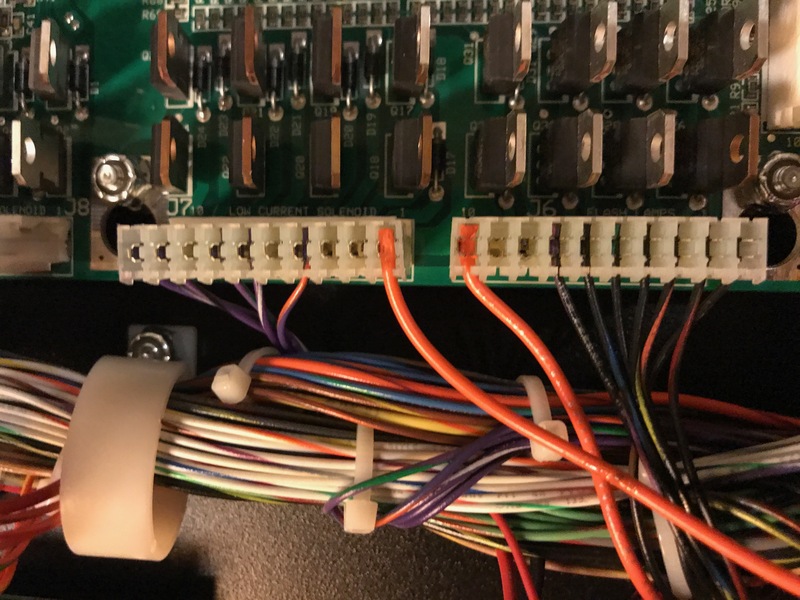 If I make any further changes, or I do this again, I want more connectors to make the harness a little easier to work with and debug. Having the connector near the solenoid makes cable management easier. Having connectors for the patches into the existing connectors would make removal easier. 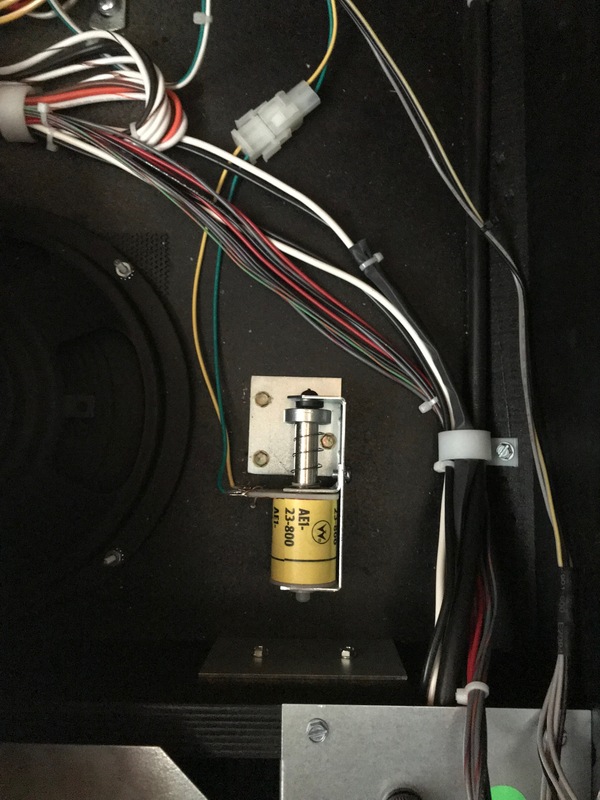 Another possible improvement: Does the shaker motor offer a place to hook in for +50V? Got a WPT back in late October . I’ve been playing it, but it’s obviously in need of some love. Decided it was time to start major shop job instead of whatever I should have been doing. In this case, it starts with the statement: “I’ll just take the upper playfield out in preparation for re-rubbering.” When I get the flippers out, I discover they need a rebuild. All of the rubber is old and hard, and a few lamps are out. Right ramp has busted welds. Very dirty around pop bumpers. A massive amount of dirt near the upper left flipper, like some rubber has been getting ground up. Start disassembling and found a couple wire ties in places that were not supposed to have wire ties. All four flippers are egged out. You wouldn’t know it on these Stern games, since both of the ramps were still make-able shots, but there must be some flipper power missing. Two welds are broken on the right ramp. But I have a friend who can weld enough to fix it. Upper playfield is very dirty. I could polish it. Or I could install a new part. I’m switching to the overly bright LED bumper caps on this game. I usually avoid this kind of mod, but in this case, the under upper-playfield area is so very dark, I think it’s called for. So far I’ve got one ramp out and two wireforms out. I just installed a knocker in my World Poker Tour. 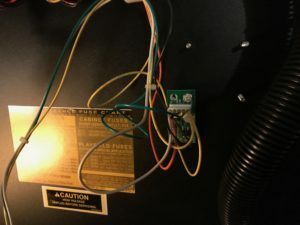 I used Stern’s step-up board, the one that is used for the kickout from the bumpers, available from the usual suspects. I got most of my information from this page. I used a 520-5254-00, available from Pinball Life, and documented in the WPT manual. Because the knocker drive transistor can only sink 20V, a step-up board is required. 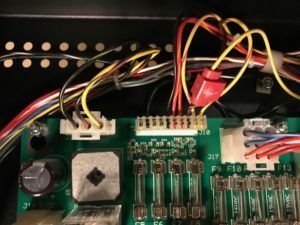 Three connections to the game are required: +50V, solenoid ground, and signal. Okay, you could probably use +20V if you wanted a wimpy knock from a wimpy coil. You can source the signal from the connector under the playfield that is used to drive the coin counter that nobody installs. +50V and solenoid ground can be found on J10. On WPT, it appears that pin 8 is not used, but it is fused by F7. Great deal! Three pins on J10 offer solenoid ground. I used pin 2, but 4 and 5 would have worked. (You can pick up ground anywhere, but it is probably better to pick up the officially blessed solenoid ground.) I happen to have an IDC punch-down tool. I’ve had it for fourteen years, and now I’ve used it. 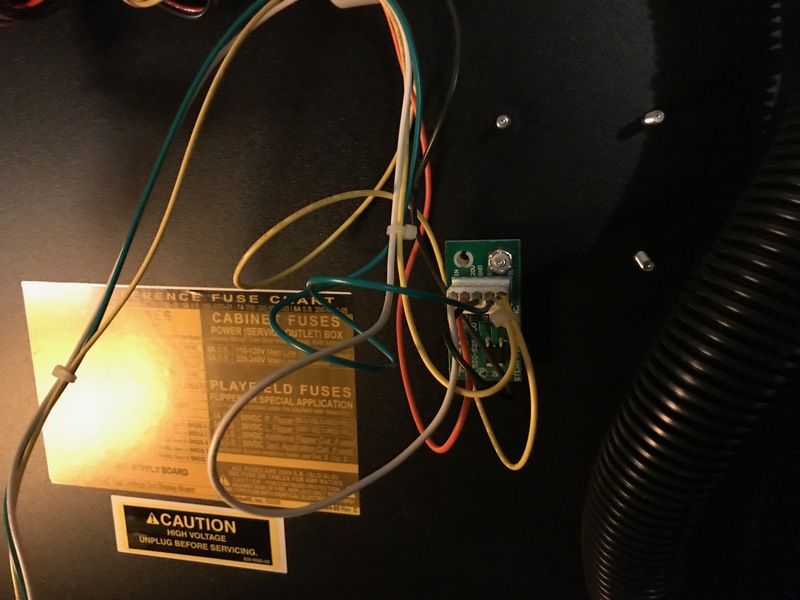 I didn’t have to solder anything (other than the coil) because I picked up all of the connections from connectors that already existed, which makes for a nice clean install. I installed a Williams knocker, in the head. Mine was apparently from a High Speed, but it’s the same mechanism Williams used until they gave up on knockers. The geometry of the Stern head leaves a lot to be desired from a knocker perspective. I will probably install the next knocker in the cabinet, and even that can be trying as I have discovered previously. I put the head in the upper-right mounted to the side of the cabinet. This was a tight squeeze for the assembly, and it was hard to install and it will be hard to remove for service. I mounted the knocker on a block of scrap wood, then screwed that to the cabinet. I don’t like the adapter block, but because of the diagonal brace in the corners of the head, a the knocker wouldn’t have clearance if it screwed to the head directly, and there’s no room for it on the back of the head. I set the Q24 option to “knocker” and the “knocker volume” to off. I discovered the “knocker” test drives both the real knocker and the fake knocker and it’s loud as hell. There is no other test for Q24. Next time I install one of these, should I ever get another Stern game, I’ll probably try the Gottlieb knocker. It doesn’t require a separate strike plate. Running on +50V, it’s probably not as anemic as in a Gottlieb game. Or, perhaps I’ll mount a Data East-style unit in the head, down below the computers, where there’s space. A modern Williams knocker fires up and has no spring. Bally, Data East/Sega, and old Stern Electronics knockers fire at the side of the cabinet. The bracket used for Data East is the same as Williams, but the plunger is different. Old Williams knockers, like on Firepower, and Gottlieb knockers fire at their own bracket, and are mounted in the cabinet. Stern Pinball has never used a knocker. The sound of a Stern knocker is different than a Williams knocker. It’s more of a thud than a crack. I suspect the coil pulse is longer. I prefer the knocker on my Twilight Zone, but any mechanical knocker is better than the pop on a Stern game. Adding a knocker to my Simpsons Pinball Party was similar, but I used a “Data East” knocker assembly (really, it appears to be a kickback assembly) and mounted it in the body. This gets even more of a “thud”, and it’s not nearly as loud, but not as satisfying. Finding solenoid ground and +50V was more difficult and I did a bad job. I should clean it up. The newer step up driver boards use 20V and 50V. The coil will fire using the 50V power. The 20V input is used to sense weather or not the voltage is present. This is important because if you have 50V without 20V, the coil will turn on until the fuse blows. I would recommend the new board! I’m trying to confirm that the two boards have the same part number. There are pictures of a five-pin version online with the same version number, but the parts sellers only picture the four-pin version. In general, I don’t rebuild Gottlieb “fat boy” flippers as part of shopping out a game. This is in contrast to Williams solid-state flippers, which do wear out. The exception is the EOS switch. The lever arm will chew a hole in it over a couple decades of play, and it’s worth checking first. It may be fine, or it may need replacement. I have also seen the plunger/link crack apart. But otherwise, these flippers just work. On my Monte Carlo and couldn’t make the Firepower-esque lock shot, up the left side and into a saucer. Without this shot, there’s no multiball, and no way to spin the roulette wheel. The flippers seemed fine otherwise, but were clearly missing some oompf. I replaced the sleeve because it’s cheap and checked out the link assembly, which seemed to be fine. I decided to get more drastic. I have a couple MA-989 upgrade kits with NOS link assemblies and new EOS switches that should make the EOS switch also nearly indestructible. I decided this was a fine occasion to use one. Ultimately, I replaced the EOS and lane change switches, the coil, the coil stop, the plunger/tip, and the lever that clamps around the flipper shaft. Still, it was weak, and in fact it was a little worse. But in the process, I had installed the flipper with an angle that was too horizontal at rest. I think I was working off the angle of the left flipper, which wasn’t necessarily right to begin with. I went back and took a look the flyer and went for a droopier angle, and happily, I can make the shot! I suspect that flipper mechanism develops a lot of power at the end of its stroke. Plus, the angle made the flipper play funny, and I may have had a hard time adjusting. I will keep all the parts I took out as spares—I don’t think they’re bad. And I will pay more attention to the angle in the future. I am not enamored with the MA-988/MA-989 upgrade kits. They require some care to ensure that the return spring isn’t touching the switch. The geometry of the flipper just doesn’t allow this fix to be very good. Plus, my NOS parts came with NOS factory rust in non-critical locations. The original flippers work pretty well without the fix.anyway. I will probably use these kits up and switch back to the original-issue parts once I exhaust my small supply. I chased down the flash lamp problems on my Monte Carlo. The flash lamps next to the roulette wheel were locked on. I found a out-of-spec transistor on the driver board. The under-playfield transistor (MJ2955) tested fine once the driver board was disconnected, so I just left it. The other one was weirder. The “left dome” flashers did not work. Lamps themselves were fine. The transistors tested okay, and there was voltage at the lamp socket, but grounding the lamp socket did not cause the lamps to light. I found that the two lugs of the lamp socket were shorted together. Apparently the resistor in circuit that steps down the voltage is good enough to protect the transistors from failing, or I just got lucky. I might have caught this sooner if I’d noticed that the last person to re-rubber the game had looped rubber around 89 sockets rather than reading the manual for the correct rubber ring sizes.